Sanjay Leela Bhansali's controversial film Padmaavat (initially titled Padmavati) starring Deepika Padukone as Rani Padmavati, Shahid Kapoor as Maharawal Ratan Singh and Ranveer Singh as Alauddin Khilji releases today amid high security. Sanjay Leela Bhansali's controversial film Padmaavat (initially titled Padmavati) starring Deepika Padukone as Rani Padmavati, Shahid Kapoor as Maharawal Ratan Singh and Ranveer Singh as Alauddin Khilji releases today amid high security. The film has been in news for all wrong reasons ever since it went on floors. Inspired by 16th century Awadhi poem - Padmavat - penned by Sufi poet Malik Muhammed Jayasi, Padmaavat is one of Bhansali's most ambitious projects. Also featuring Aditi Rao Hydari as Mehr-un-nisa (wife of Alauddin Khilji), Raza Murad as Jalaluddin Khilji (uncle of Alauddin), Jim Sarbh as Malik Kafur ( close aide of Alauddin) and Anupriya Goenka as Rani Nagmati (first wife of Maharawal Ratan Singh), Padmaavat has witnessed massive protests by various Rajput groups across the country. The Supreme Court had paved the way for the nationwide release of Padmaavat after some states had issued notifications banning the film. But the Rajput Karni Sena is hell bent on disrupting the film's release by resorting to violence. Police HQ issued detailed guidelines to police force, clearly stating protection to be provided to people screening & watching #Padmaavat. So far protests have been done within the law. If there's an untoward incident we'll take action: Sanjeev Kumar Singhal, ADG (HQ), Bihar told ANI. "Law & order situation is peaceful across the state. Only 2 minor incidents have been reported in Jalore & Udaipur. If multiplexes ask for protection we'll certainly give it to them.Appeal people to protest peacefully, not take law into their handsm" ANI quoted Rajasthan Home Minister as saying. Addressing reporters, Haryana DGP BS Sandhu said, "18 people have been arrested in connection with attack on a school bus and torching of a Haryana Roadways bus in Gurugram yesterday, case registered. "All theaters provided with adequate protection. Things peaceful now. If someone is found getting involved in unlawful activities, they would be immediately arrested & strict action will be taken. Govt is providing full protection to those ready to screen #Padmavaat," ANI report quoted Sandhu as saying. BJP members should be ashamed of themselves for not putting an end to violence by protesters opposing the release of Padmaavat, says Congress. Meanwhile, SP (City) Dehradun, Pradeep Rai told ANI, "Dehradun All the vehicles are being checked and every person is being frisked. All the shows were houseful yesterday. It was peaceful yesterday and so will be today. We are prepared for all situation. Arrests will be made if need be." Karni Sena members protest outside Lucknow's Novelty cinema. The members present roses to people and appeal to them to not watch the film. A protester says 'we will also compensate money of the tickets in case people have already bought' #Padmaavat, as per ANI. "Yesterday some people pelted stones on school children in Gurugram. I couldn't sleep entire night. If our children are pelted with stones on Republic Day eve, a few kms away from nation's capital, it is a matter of shame for the entire nation," ANI quoted Delhi CM Arvind Kejriwal as saying. Karni Sena members protest at Lucknow's Novelty cinema by presenting roses to people. They have opted for a non-violent form of protest by appealing to people to not watch the film. They are even ready to compensate of the tickets. "We will also compensate money of the tickets in case people have already bought," ANI quoted a protester as saying. AIMIM leader Asaduddin Owaisi takes a dig at Prime Minister Narendra Modi while talking about the violent protests against Padmaavat. "This is nothing but 'pakoda' politics practiced by BJP. Prime Minister & his party have meekly surrendered before these people who are protesting. He has 56 inch chest only for Muslims," ANI quoted him as saying. 18 people have arrested in connection with the attack on a school bus in Gurugram yesterday. The culprits will be brought to Sohna Court later today. While talking to reporters about the school bus attack, Haryana Minister Ram Bilas Sharma said, "It is a worrying incident,and I am sure there will be a solution to this whole issue today. Hume aisi ghatna ka andesha nahi tha (we didn't expect such an incident to happen)." Contempt petition filed against four states in Supreme Court. The petitioner claimed that the states in question had failed in their duty to maintain law and order. Padmaavat screening cancelled in two theatres in Jalna area of Maharashtra. Stones were pelted on the theatres on Wednesday night, following which three people were detained. Senior BJP leader Subramanian Swamy spoke about the controversy surrounding Bhansali's Padmaavat. "It opens old wounds, and that is why such films should not be made. what is the historical value of it? Zero. They say it has nothing to do with history, then why are you making it? Also, why is Rahul Gandhi not taking a stand on it?," ANI quoted Swamy as saying. 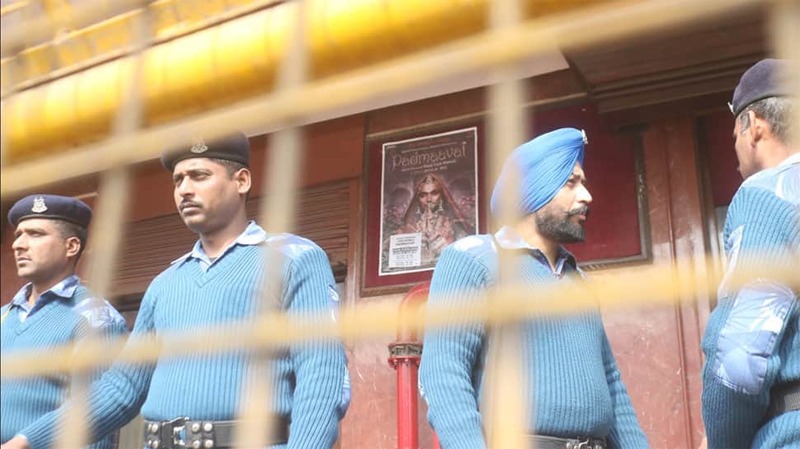 Security has been beefed up outside cinema halls in Varanasi. Police have not witnessed any protest yet but have increased security as a precautionary measure, reports suggest. The film has been drawing mixed reponses from the political class. Addressing reporters, senior Congress leader Digvijay Singh said, "Films which hurt sentiments of any religion or caste should not be made." According to an ANI report, Vijender, a bus conductor in Gurugram said, "Protesters were pelting stones on cars and clashing with Police, we tried to navigate safely but got caught in the violence, fortunately we were able to ensure safety of children which was our priority." Tight security ensured outside Hyderabad cinema halls as Padmaavat hits theatres today. ANI shared the visuals of school bus attacked in Gurugram over Padmaavat row. UP government has issued an advisory for the safe screening of Padmaavat. The government has said that those protesting will be dealt with strongly, said reports. "Freedom of Expression does not allow one to distort historical facts. Therefore, we should sit with those protesting and solve the issue. When things don't happen with consensus, they lead to trouble", VK Singh, Union Minister on Padmaavat row. Meanwhile, Delhi theatres witness a good occupancy on opening day. Bihar cinema owners association say no to screening Padmaavat, say reports. Shahid Kapoor, who has teamed up with Sanjay Leela Bhansali for the first time essays Rajput warrior Maharawal Ratan Singh. Talking about the film and his character, Shahid said, "Prior to Padmaavat I was nervous, because people know very less of my character (in the film). It's a very important film for me. It's tough to essay a role like this. I feel thankful & honored. We've done everything, it's time for people to decide what they feel."